Take out a strand of golden chain, find about four or more points on the chain and then string the locations one by one as I do in the picture. Assemble each 12mm Swarovski Bead with two Rhinestone Beads. Then string both three with one headpin. Loop the top with 6~7mm pin and trim the extra part. Hang the two branches onto chain. Finally, clip on the bling bling Acrylic Rhinestone Beads. So far, a shining Christmas earrings has produced! Several dangling chain decorated with the Acrylic Rhinestone Beads, arenâ&#x20AC;&#x2122;t they just look like the beautiful Christmas tree? 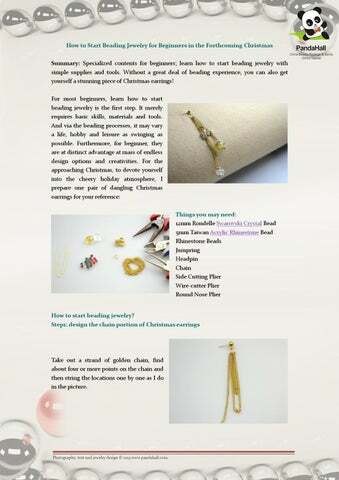 More simple inspiration projects about how to start beading jewelry, try our pandahall!